The GAA Coach Education Awards have been streamlined into three distinct pathways – Child, Youth and Adult. Coaches should determine which age group they wish to coach before embarking on the courses along that pathway. 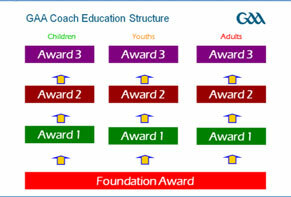 All coaches must complete the Foundation Award (theory units can be completed online), including a three hour module on the ‘Code of Ethics and Best Practice’, which is a compulsory unit for any coach or volunteer who works with children, youths and/or vulnerable groups. Open to coaches who have completed the Foundation Award. A series of interactive modules which are designed to engage coaches and motivate them to develop their coaching skills and move to the next level of coaching. Open to coaches who have completed the relevant Award 1 Course. The content involves interactive modules for coaches who are working at performance levels. Coaches will be required to complete a portfolio of evidence, a number of lesson plans and deliver a practical session on a particular coaching strategy. Ulster GAA also organise a number of Diploma Courses accredited by OCN NI which are on the Qualifications Credits Framework. These courses are ideal for coaches who have completed Award 1 & 2 NGB Courses and who want to specialise in team management and/or performance coaching. Additional coach development courses are delivered on an ongoing basis during the closed season. Details of all our courses can be found in the Irish News each Tuesday.